Comprising the essentials for instant film photography, the blush gold FUJIFILM INSTAX SQUARE SQ6 Instant Film Camera with Case Kit from B&H pairs the square-format camera body with a 10-sheet pack of INSTAX SQUARE Black film and a 10-sheet pack of standard INSTAX SQUARE film. It's hip to be square with the blush gold INSTAX SQUARE SQ6 from FUJIFILM. The first analog camera to accept INSTAX SQUARE film, the SQ6 is a simple and fun instant film camera that produces 2.4 x 2.4" square prints. The camera's sleek and stylish design incorporates a Fujinon 65.75mm f/12.6 lens, which offers a three zone focus design, with a minimum focusing distance of 11.8". A small selfie mirror is built into the front of the lens design for accurately composing self-portraits and a dedicated Selfie Mode can be used to optimize focus and exposure. The camera's design also features an optical viewfinder with a central target spot for accurately composing images. A built-in flash is also featured, for illuminating scenes in low-light, and three colored flash gels—orange, purple, and green—are included for adding a creative wash of color to your subjects. Automatic Exposure Control takes into account ambient lighting conditions to ensure proper exposure settings, a Light/Dark mode lets you apply +/- 2/3-stop of exposure compensation, and a creative Double Exposure mode lets you blend two exposures onto the same frame. This pack of Fujifilm instax SQUARE Instant Film contains 10 sheets of instant color film that is compatible for use with instax SQUARE cameras. This film features vivid color reproduction with natural skin tones, and its refined grain structure provides high image sharpness and clarity. Each 3.4 x 2.8" sheet of film produces a square 2.4 x 2.4" glossy image area that is surrounded by a stark black border. 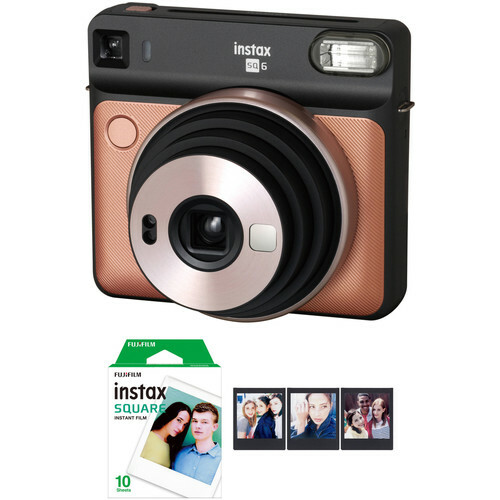 Box Dimensions (LxWxH) 6.3 x 6.3 x 4.15"
INSTAX SQUARE SQ6 Instant Film Camera (Blush Gold) is rated 4.4 out of 5 by 10. Rated 5 out of 5 by Barry from This Instax just arrived. It is HUGE; I almost refused... This Instax Square SQ6 just arrived ten minutes ago. The delivery guy, familiar with cameras and B&H wanted to see what I had bought. I couldn't remember so I opened the box. The camera is huge - be prepared. I almost refused delivery. But, the weird looking (gold - first available) camera capable of making instant prints is going to make a statement to my intended audience, so the size will just reinforce that statement. I think that this falls into the "ugly duckling" category, meaning it will be loved and admired. The monster seems to be a keeper. Perhaps I will write more after having used it. I had to give a rating, so "I love it" means "so far." Rated 3 out of 5 by David C. from Fun, but a bit clunky The good: the bigger square format pictures are nice. Controls are simple. Pictures look nice. It's great for instant gratification mementos. The not-so-good: the camera is bulky. The shutter placement is awkward. The viewfinder isn't usable if you have glasses, and it's hard to know what is or isn't in the frame, or even if you are level. The CR2 batteries are not rechargeable. It's a bit pricy. Rated 4 out of 5 by Kevin from Bigger but not wow It's a great little camera, tends to over expose. The paralax is huge they should have swapped the flash and view finder the paralax is bad heavier learning curve if you've never delt with it before. Features are fun, format is great, just wish it was larger. Size is a little bigger than the mini. Rated 5 out of 5 by Resa from Big Hit at Get Togethers Grew up taking Polaroid pictures and wanted some nostalgia. Chose this camera because the pictures are a little bigger. It is easy to use and has lots of settings, including selfie. Took it to a 60th birthday party recently and everyone loved the pictures and said they had to go buy one! The general comment was that no one prints pictures anymore. They made great party favors! Rated 3 out of 5 by Sean from Big but comfortable to carry I was surprised how big this camera was compared to the Instax minis. Of course the film is bigger but I still expected it to be a bit smaller. Despite this, its fairly easy to carry around, especially with a neck strap. Since its so flat, it lies against you nicely and doesnt flop around much. Parallax is really bad if youre closer than 5 feet away. This isnt an SLR so you arent looking through the lens when you compose, so be prepared to shift your framing when youre close or everything will be in the corner. The shutter button is flat and in a weird place so it takes a few times to get used to where it is, unlike other Instax models which sometimes have 2 prominent buttons. Photos are sharp enough and the square format is pleasing. Dont expect the sharpness of old SX-70 cameras but theyre good enough for parties and casual Photography. If I could rate it 3 and a half stars, I would. Its better than ok but not quite as good as Id hoped. Rated 5 out of 5 by Katsu from Great Instant Camera Ive been using this camera everyday since I have purchased it and highly recommend it. While the functions are pretty basic for intermediate-pro photographers, it really makes you think back to the basics. Form factor is nice and with the camera turned off the lens retracts and packs away nicely. Rated 5 out of 5 by Leandro from Love this camera! The aspect ratio of 1:1 of this camera films is great! It gives that real instagram feeling. Loving taking this camera around with me on special events and trips. Rated 4 out of 5 by Diego from SQ6 It is a good camera of instantaneous photos, until now I have not had problems, the photos are very nice. Are the batteries included with the initial purchase of the camera? yes the camera does come with two CR2 batteries in the box.